North Star African Violet Council Twin Cities: Congratulations Kathy Lahti for Best In Show at Nationals 2012! Congratulations Kathy Lahti for Best In Show at Nationals 2012! 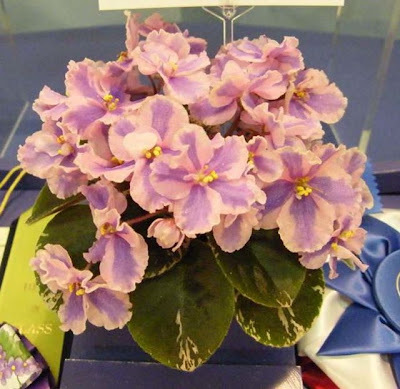 The North Star African Violet Council and all the violet folks in Minnesota would like to extend their most enthusiastic CONGRATULATIONS to Kathy Lahti for winning BEST IN SHOW at the AVSA Annual Convention 2012!!!! Kathy won with African violet 'Eternal Orbit'. Not only are Kathy's plants excellently grown but I'm always amazed that you can travel for hundreds of miles with a plant like this that is so perfect and get it to the show looking like this!